From the New York Times bestselling creative team of Fred Van Lente (Amazing Spider-Man, Hulk: Season One) and Clayton Henry (Uncanny X-Men)! Born and raised to be the perfect assassin, 18-year-old Obadiah Archer has been chosen by The Sect -- a cult of fanatical extremists -- to destroy evil incarnate. 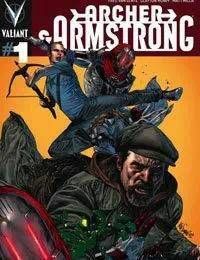 But when Archer finally lays eyes on his target -- a surly, hard-drinking immortal named Armstrong -- he finds himself pulled into an unlikely partnership that will take him on globe-trotting quest to stay one step ahead of The Sects next nefarious plot!